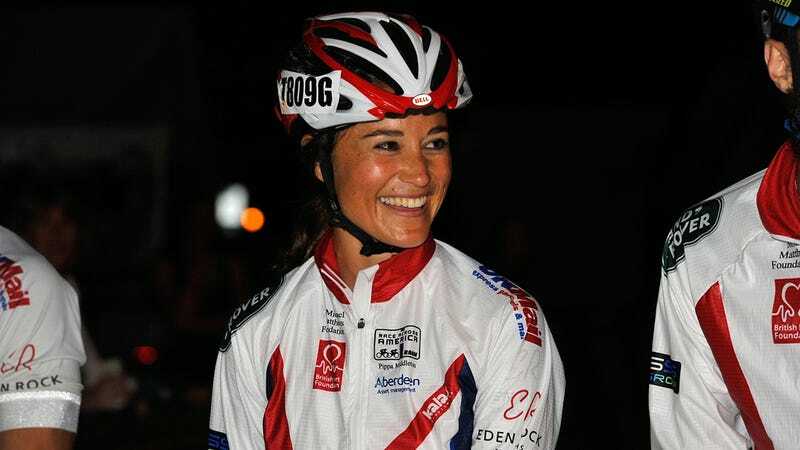 The royals are apparently very angry at human Pinterest board Pippa Middleton over her Today Show interview last week, which showed her grimacing at Matt Lauer for 30-minutes and giving away all the big royal secrets like "I get along well with my sister Kate Middleton" and "the Royal Wedding was a lot to take in." So much scandal! It feels like something straight out of The Tudors! A Buckingham Palace "source" (probably just Andrew Lloyd Webber hiding behind a suit of armor) tells Radar that the Royal Family is "livid," "furious" and that "they wish that she would shut-up. It is obvious that she wants to define her identify and step out of her sisters shadow, however she needs to know her place." I'm don't know what Pippa's "place" is seeing how she's not a royal and isn't bound to old-timey castle law, but I'm pretty sure it ranks somewhere between the Princess Diana Beanie baby and the Queen's least favorite corgi. Countering previous reports, a different source (Andrew Lloyd Webber in a woman's wig) says that Clarence House, where William and Kate live, signed off on the interview and have no problem with it, so who knows? Maybe Pippa Middleton and her now-publicly-revealed thoughts on bridesmaids' dresses ("They're nice") have caused the rift that will ultimately destroys the British monarchy. Or maybe no one actually cares.